I don't know what it is about bottles but I just love them, especially vintage blue ones. In an effort to avoid being featured on the next episode of Hoarders, I try to keep only pieces that have special memories attached to them. Do you remember our huge glass water jug that we picked up while vacationing in Cayucos? Thankfully it's survived 2 cross country moves along with the Blue mason jars that were a gift from B's Grandma Nadine from our visit in Amarillo. And since we are wine lovers, we keep our good times in a bottle. I love the way the corks look inside the glass. It also feels like we have captured those memories and truly "contained" them. Another thing I am drawn to is boxes. I fell in love with this Mouton Cadet when I was a young girl and have had it for years. It currently holds some tea. I love these glass floats from our trip to Morro Bay especially paired with this sweet little seahorse that we bought at Cracker Barrel. Yes, Cracker Barrel which by the way has it's headquarters not too far from where we currently live here in TN. Our move to TN does not mean our Californian roots are gone. I need my palm trees and here they are in my own version of little Santa Monica. Thank goodness B is a sealover too so when it comes to decorating our home, we don't have many decor disputes. But his love of the snow and cold weather is where we do struggle a bit. However, every couple has to compromise and that is where our Alaskan corner comes in. Alaska is B's homeland and it also must be represented in our home. We have some sweet pictures of his Grandma being pulled by snowdogs and a pair of snow shoes that really do blend in well with the rest of our home. And speaking of B, it is he who is the official sealaura designer. I can pick the pieces, but he knows how to put it all together. How do you go about decorating your home? All the nautical touches in your new home are so great. Love, love the ship lamps! And thanks for the link to the octopus post! I also love large glass bottles and green or blue glass items. It's always a worry moving them! Your port/starboard lamps are fabulous....very jealous.... and I love the seahorse print. Gorgeous! I love the seahorse print1 I also love old glass mason jars. Great practical storage yet also so pretty! I didn't realize you loved your vino; I have a similar container of corks and fun memories to go along with them. I'm glad you're enjoying this transition into your new beach house! Love the aqua bottles, the more the better! I love all of your blue and green touches in your home. Those mini palm trees are adorable! My mom has quite a collection of the Japanese glass floats, and I've always loved those. 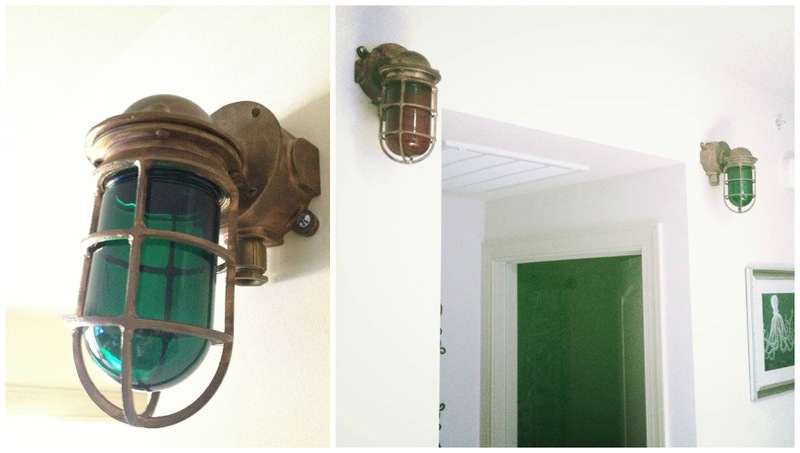 I am so glad you picked up those nautical lights, how neat that they came from a local ship. I love them! I instantly want to go to a vacation by just looking at your house. It is a perfect interpretation of homey resort vibe. I love it! I like how the green color pops out in the ornaments displayed. The green-tinted bottles represent the nautical theme very well. And even if your husband wants your own Alaskan corner in your beach house, it's nice how you've accommodated it fittingly.